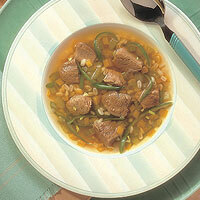 A comforting bowl of beef barley soup is a great way to warm up on a cold winter's eve. Heat oil in Dutch oven over medium heat until hot. Add onion, carrot, celery and garlic; cook and stir 5 minutes or until tender. Add beef, 5 cups water, salt, thyme, pepper and bay leaf; bring to a boil. Reduce heat; cover tightly and simmer 1 hour. Remove cross cuts. Cut beef from bones; cut beef into 3/4-inch pieces. Skim fat from soup. Stir in beef and barley; continue cooking, covered, 50 to 60 minutes or until beef and barley are tender. Add green beans; bring to a boil. Reduce heat; simmer 2 to 3 minutes or until beans are tender. Discard bay leaf.